Start searching for loads and trucks now! Click here to learn about free posting options, or use the form below to start searching now. Sign up now and start finding freight anytime-anywhere! All sorts of awesome features! Custom Columns and Categories NEW! Booked and Pending Loads NEW! Store and Send Documents NEW! Download the Driver App Today! Enjoy unlimited searches with the Direct Freight Driver app. 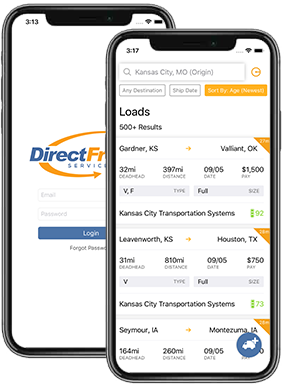 The Direct Freight Driver app lets truck drivers search more than 300K loads daily from reputable brokers & shippers on the Direct Freight network. Users sign in with a current Direct Freight Services username and password to start searching for loads. "I love both the quality and quantity of loads I can find at Direct Freight."